This week on Murphy’s Magic Mess the Mama Dragon and her minions decided to take a walk on the Weird Side with their music. Starting with Walkin’ in the Woods by Elvendrums they took a path of oddness that hopefully entertained the listeners. A special note about the third track, Madiba by Ricky Kej and Wouter Kellerman: 18 July was the birthday of the late Nelson Mandela, an inspiration to his people in South Africa and indeed to the world as a whole. Madiba was the name given to him by his people, it means Father. This track comes from the CD Winds of Samsara. Samsara is from the Sanskrit for “cycle of life” or “reincarnation”. As a tribute to the late James Garner, actor, we played the full TV theme from The Rockford Files. Murphy’s Magic Mess airs live every Sunday at 9am Central on KZUM-Lincoln/KZUM-HD (89.3FM in Lincoln, NE). You can find the Mess on Facebook. Pagan-Musings Podcast Channel is pleased to introduce a new program on their schedule. Sacred Oak Circle. Sacred Oak is hosted by Rev Gary, a third degree high priest of the Correllian Nativist Tradition, based out of the Kansas City area. He’s been a producer on Pagans Tonight and has taken a break from podcasting. He’s climbing back into the saddle with PMPChannel with his own bi-monthly program. Sacred Oak Circle will air every other Tuesday starting on March 18, 2014 at 6pm Central time. In his introduction he joined RevKess to talk about the concept and format for Sacred Oak Circle. Rev Gary comes from a Wiccan background, a unique voice to our channel. He’ll be talking about Wicca, the Correllian tradition in particular, reiki, candle magick, gems and crystals and stones and so much more. He’ll have guests on from time to time to talk about various topics and bring their own perspectives to the table. Rev Gary is also a big fan of Pagan music, so he will be spot lighting various artists and groups and sharing some of his favorites along the way. Who knows, there might even be an interview or several with some of those Pagan musicians! Omnia – Wytches Brew – Alive! You can find out more about Rev Gary and Sacred Oak Circle by visiting the Facebook page for the show as well as the blog. Let us hope that the lamb March promises comes to us soon! Sunday morning greeted Murf and her Minions with a blast of COLD! And some tech and mechanic issues that made for an interesting morning at the Mess. Luckily everything worked out well enough and Phil’s vehicular woes are currently taken care of. We’d like to give Sister Jasmine of the Glorious Gospel our thanks for helping Murf get set up as *K8 was running to get Phil to the studio after his van broke down. A new segment has been added to the show recently. Or we should say a segment has returned. A bit of news and information on the Pagan community. Years ago Murf’s former cohost Diz did such a segment and after he left the show it just hasn’t been happening. Murf wanted to add it back, so we are doing so. We actually started this in February, but it didn’t become official until this weekend. Phil updated us on the condition of Donald Michael Kraig, author and teacher, who is battling cancer. The prognosis is not bright. Our thoughts and prayers go to him and his family. May Asclepius be with him! And praises to the Gods of healing, Morning Glory Zell is able to return home after tackle kidney issues related to her cancer. She still need dialysis, but she can go home after each session now. The Wild Hunt – Omnia – Crone of War! Hex Hop – Marilyn T. – ??? If you know the album this came from, please let us know in comments. 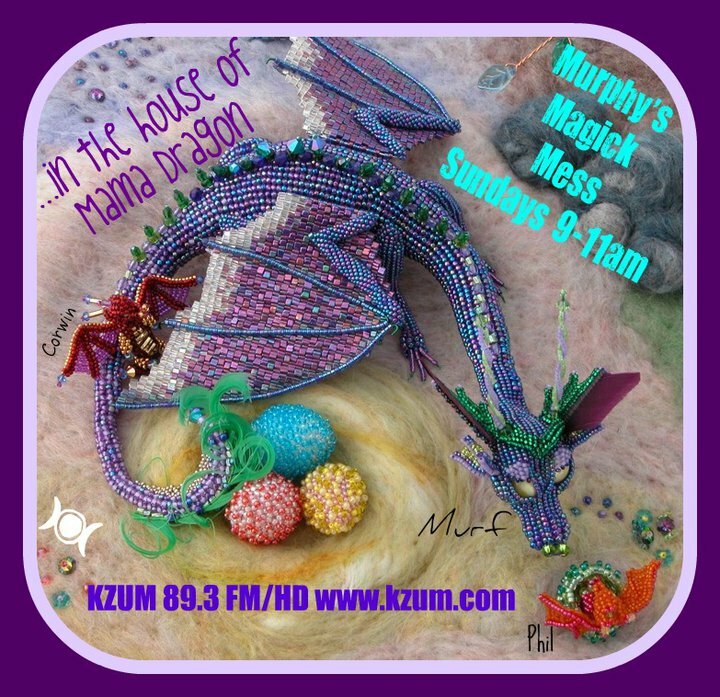 Murphy’s Magic Mess airs live every Sunday at 9am on KZUM-HD 89.3FM in Lincoln, Ne. Drawing near to its 20th anniversary, the Mess is the world’s longest running Pagan content program on terrestrial radio. You can listen online at www.kzum.org or use your favorite mobile listening app on your smartphone or iPhone. RevKess had a blast with the 10th edition of Musica Pagani. Drumming in the Harvest was full of drumming and lively music. A true harvest celebration. With harvest related pieces from Damh the Bard, Jenna Greene, Cernunnos Rising and Heartbeat, as well as drumming interpretation of African inspired music from Hennie Bekker and rock styles from Omnia, this edition brings you a collection of music from around several places around the globe. This was a real chance for RevKess to share some of his favorite drumming pieces he’s collected over the years, most of his favorite drumming groups have been kind enough to allow airplay on PMPChannel. Tuatha Dea, Elvendrums, Dragon Ritual Drummers and Frenchy and the Punk to name but a few. It is the 5th Sunday in a month, which means RevKess gets to play around a little more with the music for Musica Pagani. Instead of a combo of New Age and Pagan music, it is all vocals or lively instrumentals this time around. This edition is more a review of RevKess’s favorites on the channel. Music from groups like Murphey’s Midnight Rounders, Telergy and Omnia with some fun from Blackmore’s Night as a teaser for their new album (which parts will be aired in July) and Frenchy and the Punk (adding their Elephant Stomp in July). The show was mapped out before the disappointing need to reschedule Tuatha Dea’s interview, so there are three tracks from them and some of their Tribe (Spiral Rhythm and Celia). RevKess is working on adding Spiral Rhythm to the approved play list so the listeners can enjoy more of their wonderful tunage as well. Later this week is the 4th of July celebration on the Pagan-Musings Podcast Channel. This year we are going to do it on Musica Pagani with lots of music about freedom, diversity and independence. Be sure to tune in this Thursday (4 July 2013) at 7pm CT for a musical celebration!